Aft deck hot water shower to fresh water rinse after your salt water dip. Our Catana 582 has three luxurious suites and an extra large bright and sunny bridge deck with full wrap around full length windows. All three guest cabins have a private entrance and are en suite (private toilet, shower, and vanity). The two engine rooms are double sound insulated from the rest of the boat. 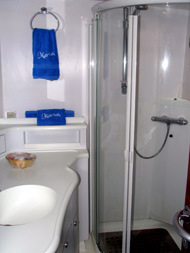 The crew cabin is separated from main cabin through a private hatch where they have a private bathroom. A fifth “sailor's” cabin is situated forward that can be used to sleep a guide, or “extra” crew. 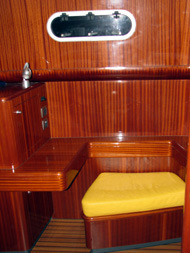 The “owner's” cabin comprises one complete hull. 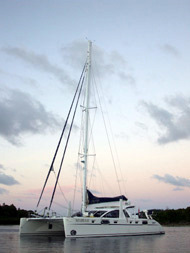 A comfortable queen size bed, large opening hatches, two air conditioning units, sit down computer desk, DVD player, wrap around shelving, enclosed head, separate shower, washing machine, and vanity with wrap around mirrors all combine to make the Catana 582 one of the world’s most comfortable charter boats. A second cabin contains a large queen size bed with opening hatch facing down toward the sea between the hulls providing an exquisite view of the rushing water. Another large opening hatch sits in the side of the hull, blowing cool fresh air down toward the computer station desk. The enclosed head, shower, and air-conditioning complete the luxury rarely seen aboard the water. 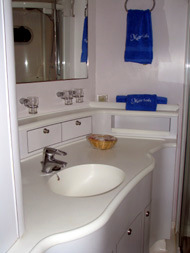 A third cabin contains two single beds or one queen (simply request the configuration desired), a sit down computer table, large opening ports, enclosed bathroom with shower, air-conditioning, and wrap around shelving to keep your personal comforts close at hand. Here is a copy of our "Welcome Aboard!" pack. Please have read to see some of the luxury we provide. In an effort to make your trip more pleasant please take a moment to review this list of onboard guidelines and recommendations. Feasts - Three meals a day are served onboard, but you might like to take advantage of some of the local Tongan feasts served at some of the neighboring restaurants. These options can be viewed in the black folder stored in the main salon. Please note the resorts need to plan a day ahead so we’ll need to reserve the day before. Fishing - Mariah has a complete compliment of fishing gear and is an excellent fishing platform. We tend to troll fishing gear while moving between anchorages. If fishing or the blood from fish disturbs you please let the crew know. We can also use the ships tender to fish, or fish trips can be arranged off the vessel. Alternatively we can use Mariah for a day of fishing if desired. Exercise - Living aboard a boat can produce a sedentary lifestyle. Mariah has a stair-stepper aboard or Allison is a certified Yoga instructor. Morning Yoga has become a routine aboard and you are welcome to join in. Internet - In Vava 'u Internet is available through WiFi and your laptop. 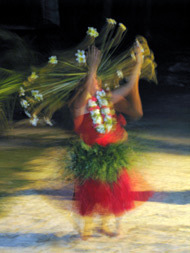 It's possible to use the Vava’u hotspot and purchase time online. The hotspot only works in Vava’u itself and a few selected anchorages. Mariah also subscribes to the government TCC Internet system that is fed through our Catana 582 catamaran through WiFi that provides service at 164Kbs in all the eastern anchorages. If you have Internet needs please let us know and we’ll arrange a time for contact. Alternatively Mariah has an emergency Sat phone/Internet connection for a fee of five USD per minute. Please note this is a very slow connection and used for emergency contact only. Smoking - Mariah is a non-smoking vessel, but if you must smoke please use the downwind corner of the boat. Please ask a crew member as we have gasoline and flammables stored on the aft deck. Water - All water used on Mariah is from our own water-maker. This means our water is pure, and disease free. We also provide bottled water. Bottles can be re-filled through the water-maker saving plastic and bottles in the trash. Feel free to sample both types of water for your preferred taste. Air-conditioning - Mariah has excellent ventilation or air-conditioning. In order to run the air-conditioning the generator must also be turned on causing a small amount of noise. Feel free to ask for the air-con to be turned on or off to suit your comfort. Windows - Each cabin has a series of opening windows. During rain any open window will channel water directly into your cabin. Please take care to close all windows during rain. Dietary needs - Mariah comes complete with a personal chef. Please mention any special dietary needs or requests. Also feel free to take over for a meal if the mood suits you. Gratuities - Crew gratuities are not included in the charter fee. A 15% gratuity is customary, but more is gratefully appreciated for exemplary service. Remember this is your vacation and we are here to make it a memorable experience. 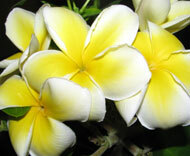 Our service is considered some of the best in all of Tonga. Our guests are pampered by an authentically-kind English-speaking crew that understands the importance of individual needs; delicious and healthy food to complement the stunning wilderness outside; and a vessel and stateroom with all the creature comforts. discreet hotel anywhere in the Kingdom of Tonga. meeting place for the most discriminating of tastes. Mariah is connected to local WiFi and if needed in an emergency we also have two satellite phone systems to provide voice or Internet connection anytime on any ocean. Three full meals a day are provided onboard prepared by our excellent chef along with snacks and drinks.